The Cake; we’re going to have a Italian sponge cutting cake from Amalfi Pasticceria, their cakes are absolutely gorgeous and such a lovely opposite to the traditional dense fruit cake. The cutting cake I am going to make and decorate myself… I know I think I may be slightly crazy for taking this on. Invites; this is another of my DIY projects Michael chose the wedding stationary theme, fonts and colours and together we came up with some ideas to incorporate our mutial geekiness into the invites, so on the back of each item there is a special design hinting to one of our geeky fandoms from Harry Potter to LOTR and CD Projekt Red’s amazing Witcher games to Doctor Who. See the Gallifreyan message thats on the back of our STDs in my previous post 13 Months To Go. 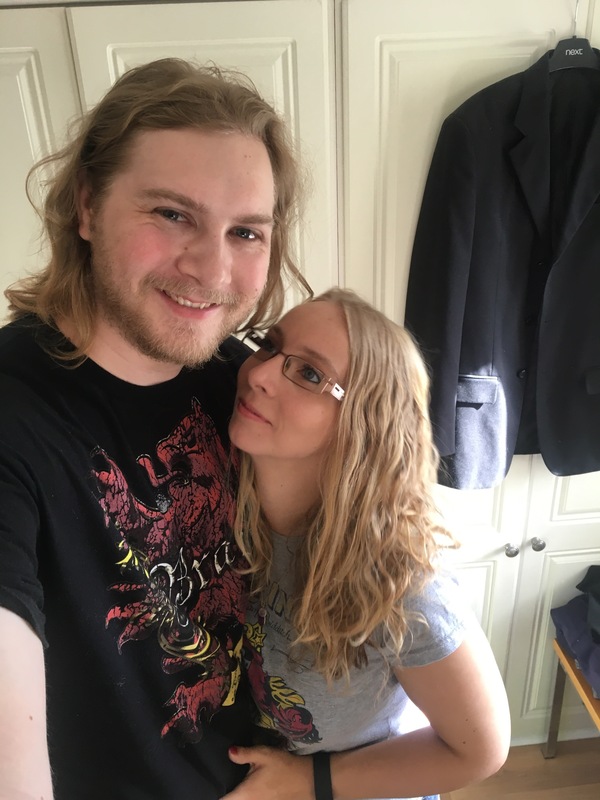 So less than a year to go to our big day 🙂 We’ve been engaged for just over a year now so I thought this would be a good time to through what we’ve got done and what we still have to do. Budgets are very tight but spreading across the two years has definitely helped us. I love doing little craft projects and so the favours was a great DIY task for me. Michael came up with a great design for a wire and bead decoration for the organza favours and the favour boxes. So with some shockingly cheap beads, some silver plated jewellery wire and a little bit of time later I have made some beautiful little decorations for our favours. So as you’ll know from some of my other posts our wedding is going to have many amazing geeky touches, the first of which is our STD cards. I’ll start by saying i’m designing all the wedding stationary (and i love it 🙂 ), so Michael came up with the style of the stationary suite, very friendly and informal and tying in our cobalt blue colour theme. The best bit is that the back of the STD features a message, a gorgeous swirly circular pattern, that hopefully a few of our guests will recognise as Gallifreyan (the language from the Doctor’s home planet of Gallifrey). I got an amazing deal with this, so I love eBay and I managed to get a job lot of 5 Luxury John Lewis Guest Books (I’ve got some plans for the spare ones) and 7 Luxury John Lewis Photo Albums (ones for ourselves, our parents and our grand parents), all for only£42!!! 🙂 and the RRP of one of the photo albums is £64.95. So here’s to all the amazing memories we’ll share over the next 11 months whilst engaged and there after all the love, laughter and joint geekiness as husband and wife. So we’ve now passed the one year to go milestone and in a blink of an eye another 3 weeks have gone. We got together on 01/09/2012, engaged on 01/09/2015 and we’ll be married on 01/09/2017, so 1st September is important to us and we celebrated the milestone by having a magical getaway to the Making of Harry Potter Studios near London, followed by a stay in a cute little hotel. Wedding flowers and bouquets can be extremely expensive, luckily for me my mum is a retired florist and jumped at the chance to do our wedding day bouquets. When it came to picking which flowers would be best we thought a trip out to Covent Garden Flower Market, London would be a perfect day out. Once upon a time Mum regularly attended the Covent Garden Flower Market to buy specific flowers, supplies and gather ideas, so we thought it would be a great research trip and maybe we could get a few bargains while we were there. I have been told so many times that a day will come when you consider just taking your parents and maybe a couple of close friends and running away to get married, forgetting the 90 guests, wedding breakfast, transport, flowers and the list goes on and on and on.